I Nyoman Gunarsa (1994- ; Banda, Klungkung, Bali) is a graduate of the Akademi Seni Rupa Indonesia (ASRI, Indonesian Academy of Fine Arts) in Yogyakarta, central Java, where he also was a lecturer for many years. 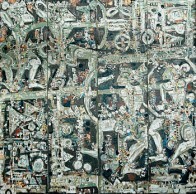 In 1970 he helped establish the Sanggar Dewata Indonesia (Superior Indonesian Art Studio) for contemporary Indonesia Art. 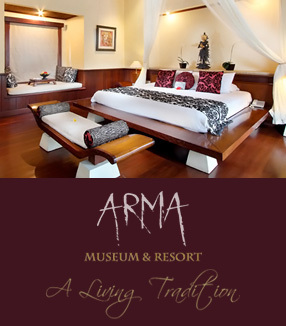 Gunarsa was an invited artist for the "Art of Bali" exhibitions at the East-West Center in Honolulu Hawaii, in1998. He established the Museum Seni Lukis Kontemporer Indonesia (Museum of Contemporary Indonesian Painting) in Yogyakarta in 1989, and the Museum Seni Lukis Klasik Bali (Museum of Classical Balinese Painting) in Klungkung in 1994. 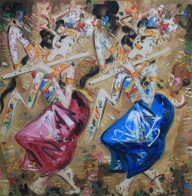 His expressionistic style works feature offerings, dancers, and wayang (puppets).